Make this year’s birthday one they’ll never forget! Enjoy all the rides, attractions and shows all day long and leave the mess to us. We can store your gifts and arrange for lunch, a birthday cake and face painting or cookie decorating for the entire group. Birthday rates are only available with an advance reservation and with 10 or more people. Book your reservation online now using the form below to make your child’s reservation today. If you are booking with less than 48 hours notice, please call us to arrange your party. This package includes unlimited use of all rides within Santa’s Village. Additional Party Add-On’s are available. The Birthday child and 1 organizing parent receive free admission and are not included in the 10 guest minimum. 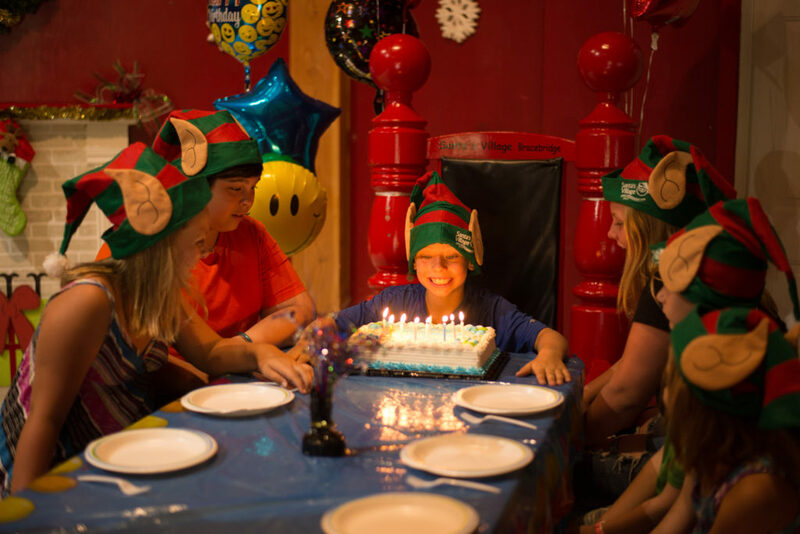 Click HERE to book your Santa’s Village Birthday Party! Planning a party for a t’ween can be a challenge. Give them the fun and adventure they grave this year with a party at Sportsland. Choose one of two options – Start with an adrenaline pumping race around the go-kart track on Rudy’s Racers, then break for lunch, birthday cake and gifts and then finish of the day with a game of mini golf for the whole group. Option two – Start the party by defying gravity on our bungee trampoline before gathering for lunch, cake and gifts. When thats all done head in side for a round of laser tag for the entire group! This package includes 3 rounds of go-karts per person (a total of 15 laps each) and one round of mini golf for the party. $20.00 +HST per person. Additional Party Add-On’s available. Please refer to the height and weight restrictions prior to booking to ensure this package is right for your guests. This package includes 3 rounds Bungee Trampoline per person and one round of Laser Tag for the party. $28.00 +HST per person. Additional Party Add-On’s available. Click HERE to book your Sporstland Birthday Party! Get some air time this summer! The Zip Line Party is perfect for kids, teens and adults who are looking for adventure on their big day. This package includes a full Zip Line Canopy Tour. Please make sure your crew meets the safety requirements before booking your party – Zip Line Safety, Sportsland Safety. Party Add-On’s available. Click HERE to book your Zip Line Birthday Party! Book your birthday reservation now by filling out the appropriate form above. Please call our group sales office directly at (705) 645-2512 to book if your reservation date is within the next 48 hours or if you have questions.